Now that you have bought your preferred bicycle, you must be thinking of ways to keep it safe from theft and vandalism whenever you are not near it. A secure, reliable and lasting bike lock is one of the bike accessories you are going to find very helpful, in this regard. However, the market today is flooded with various bike lock models and types. This makes it hard for bike owners to choose the right lightweight bike lock for their bicycles. In line with their objective, to empower bike owners to protect their bikes, Kryptonite is one of the most successful brands in the industry today. As a matter of fact, they produce some of the best bike locks today. With regards to security level, the New-U Kryptolock Series 2 locks are Gold rated, capable of leveraging attacks and resisting cutting. In this regard, the lock may be used for the relatively expensive bike models, ideally bikes priced between $1,000 and $1,500. To begin with, this bike lock comprises of a 13 mm thick Shackle. The shackle in this lock is made of Max-Performance steel, hence can resist cutting tools. 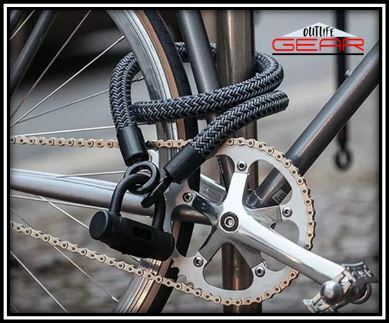 The Double loop 4’ KRYPTOFLEX cable of the lock may be used to secure the front wheel of your bike or various bike accessories. For enhanced protection, the lock features a reinforced, hardened cross bar design. In adaptation to resisting cutting tools, the tough steel material used to make this lock makes it very durable. With the New-Kryptolock Series 2 lock, dust is not going to be a problem. In this regard, the manufacturer has fitted the product with a rotating dustcover. This prevents dust from getting into the cylinder. You will also love the security offered by this lock, against leverage attacks. For this purpose, the product is equipped with a Disc-Style security cylinder. Finally, the lock is relatively easy to carry. This may be attributed to its Transit FlexFrame transportation system. For enhanced durability, the lock is covered in a protective vinyl coating. Has a double loop 4’ KRYPTOFLEX™ cable to secure front wheel and bike accessories. You may think of the Kryptonite New-U Kryptolock series 2 as the inexpensive fool-proof lightweight bike lock for the relatively expensive bikes. At a relatively low price, you will get a gold-rated lock that is long lasting, secure and functional. Weighing at just 4.41 pounds, the New York Fahgettaboudit Mini bike lock is another magnificent product by the Kryptonite manufacturer. Just as the Kryptonite bike lock reviewed above, this lightweight lock is equipped with a high-security disc style cylinder that features a centrally positioned keyway to avert leverage attacks. For extended durability of the cylinder, the lock is fitted with a sliding dustcover to prevent dust from getting into the cylinder. Owing to its remarkable capabilities and high security levels, the product is backed by a lifetime warranty by the manufacturer. If you register your Kryptonite New York Fahgettaboudit Mini lock, you could also get a cover of up to $4,500 on your bike, if a thief succeeds in breaking the lock. As such, you should expect the lock to be temper-proof, hence very secure. This being the case, it is ideal for use on the expensive bikes or in high-risk places. Features an 18 mm Steel, Max-Performance Shackle that can resist leverage attacks and cutting. For enhanced security, the product features an oversized hardened steel sleeve above its crossbar component. This is one of the most reliable, heavy-duty lightweight bike locks today. The product is produced by a renowned brand and comes with a lifetime warranty, in addition to a cover for your bike if the lock is registered. The TiGr Mini Titanium bike lock is one of the lightest today, weighing just below a pound. The use of Titanium to make this lock makes it about 3 times lighter than hardened steel bike locks of comparable strength. Nonetheless, this TiGr bike lock is very secure. The locking mechanism used on this lock is unique in its own way. Basically, it comprises of a cylinder-shaped unit that only accepts a specialized key. Once you have unlocked the lock, a button will pop up. This button allows you to remove the key, without having to lock it. You will also love the innovative shape of this lock, which allows you to easily fit the front tire and a better part of the frame into the lock. For enhanced durability and to prevent the lock from damaging your bike, it is coated using a thin rubber. Equipped with a push-button locking mechanism, does not require the key to engage the lock. All in all, the TiGr Mini lightweight titanium bike lock is not only light; it is also very strong and secure. The use of assembly and use is among the things you will definitely love about this lock. The compact, lightweight and relatively secure design of this bike lock is something to speak of. In this regard, the heavy-duty lock is drill-resistant. The product comprises of 6 heavy-duty bars as well as links. These steel bars and links were specifically designed to resist hacksaws, bolt cutters, drills and pullers. This makes it a relatively secure model. This Foldylock features a premium scratch resistant paint that is designed to prevent the lock from scratching your bike. With the Foldylock heavy-duty lock, ratting is not going to be a problem. This may be attributed to a cover that is designed to prevent rattle as you ride. If the place you are leaving your bike is not a high-risk region, a chain bike lock will suffice. In such a case, you should consider buying the compact, lightweight, anti-rattle and flexible locking solution offered by this Foldylock heavy-duty bike lock. Although the Shackle on this U-lock is described as a 13 mm thick shackle, you will be surprised to find out that it assumes a square shape, rather than a round one. Why, you must be wondering. This is because the shackle in the Abus Granit X plus 540 bike lock is made of a unique type of steel, for remarkable strength and security. As a matter of fact, the strength of this shackle may be compared to that of shackles thicker than 13 mm. This being the case, the Abus Granit X-Plus is lightweight, yet is strong enough to offer the level of security associated with the leading U-lock brands. This being the case, this lock is Gold rated by the Sold Secure organization. However, it is comparatively lighter than bike locks of the same strength. Being a German brand, the lock features a sturdy design and offers unmatched build quality. Are you looking for a lightweight bike lock, without having to sacrifice strength and security? The Abus Granit X-Plus bike lock is a German lock you can trust in high-risk areas. Now that you have the bike of your dreams, it makes sense to buy the best lightweight bike lock to prevent it from being stolen. Yes, bike theft is still common in the country and it is advisable to keep yours as secure as you possibly can. For this reason, a good bike lock is the first accessory many bike owners today buy after purchasing their preferred bikes. While there are numerous lightweight bike lock options in the market today, not all are good. So, how can you tell which of the locks is the best? Discussed below are some of the considerations you should make while shopping for the right lightweight bike lock today. In most cases, these comprise of a chain with a padlock or lock and are used to secure the bike against immovable objects. The steel chain is often covered using plastic or rubber to prevent damage to your bike. Basically, bike lock chains are considered to be very flexible, easy to use and robust. In this regard, they are ideal for medium to high risk bike parking areas. As compared to chain locks, D locks are comparatively more robust, hence more resistant to lock cutting tools. With regards to the design, these locks feature two main parts: a U-shaped steel bar and a lockable cross bar. Again, this type of lock also secures the bike against immovable objects. While D locks are robust and reliable, they are heavy to carry around. These are some of the most flexible and lightest bike locks today. However, they are not as robust as the options discussed above. This is to say that cable locks are comparatively easy to cut and should only be used in low risk bike parking areas. Lightweight bike locks under this category comprise of a series of plates that are riveted together. As such, the plates can rotate and may be folded out to form a stiff shape and folded in into a more compact form. The various folding locks offer similar security levels to U-Locks, but are relatively lighter. Folding locks are also longer and more flexible than most other types of bike locks. How safe is the place you mostly park your bike? When it comes to bike theft, some places are known to be more predisposed than others. As such, you need to consider how likely it is for the bike to be stolen, if you leave it where you intend to. This will help you understand how risky the place is; hence get the right lightweight bike lock for your mountain bike. If you regularly leave your bike in the high crime rate regions, you should get a high security bike lock. >> In such a case, you should consider buying such locks as the folding locks, chain locks and locks. If the place is rather busy and considerably secure, you may opt for a chain lock—which offers less security. However, you will need to know how secure your preferred lock is before making this decision, right? Silver – the bike locks that are rated silver by this organization can withstand vandalism done using enhanced tools. However, you should not buy a silver rated bike lock if your bike is worth more than $1,000. Bronze – Bronze rated bike locks can only withstand attacks carried out using basic tools. As such, they are only ideal for the low-risk areas or cheaper bikes. Gold – These are most secure lightweight bike locks available today. They can withstand vandalism attempts carried out using a complete set of tools. Finally, you need to consider how heavy your preferred bike lock is while shopping for the best option. Since you will be carrying the lock around with you everywhere, it is advisable to buy one that is comparatively lightweight. Additionally, you may need to get a mounting bracket as well. This makes it easier to carry the lock with you everywhere you go. Just as is the case with any other bike accessory today, you need to be careful while shopping for the right lock for your bike. If you are going to be parking the bike in high risk areas or you own an expensive bike model, it is advisable to buy a lock that offers a high level of security. Additionally, you need to pay attention to such aspects as the lock dimensions and weight. If you do not have the time to consider all these details, you can choose any of the lightweight bike locks reviewed in this guide; they are some of the best today. Hello, Welcome to my second home, here in this OutLifeGear blog I spend a lot of my free time writing tips, outdoor guides and product selection guides. I am an outdoor person and know how much it is crucial to be prepared for the outlife adventures. So this is where you will find all my sharings.